For many years, I looked up to Batman as the pinnacle of justice and heroism. He would do all he could to protect Gotham City, even if that meant giving the ultimate sacrifice. With rigid discipline and a sharp mind he would solve crimes and have the physical and mental skill to take down any foe, even if they were super powered. But what exactly is justice? For many years scholars and philosophers have tried to define what exactly justice is. Maybe it’s about equality or fairness or just about achieving the best outcomes, and probably a combination of both and more. Regardless, I’m not going to attempt to answer the question here. It’s hard to exactly define, but what’s clear is that Batman is a vigilante. The “justice” he delivers is mostly outside the scope of any governmental system of criminal law. His goal is react to crime by punishing whoever is responsible and then giving up the criminals to the authorities. In this sense, Batman isn’t completely a free agent. He does work with members of the Gotham City Police Department (GCPD) and hopes the prosecution phase of the criminal justice system does its job. Given the corruption of Gotham City, this makes no sense. When the institutions placed in charge of protecting Gotham City fail, something has to rise from the ashes. And Gotham City is no ordinary city either. In Batman’s world there are what I will refer to as meta-humans, or people with super powered abilities. Even in the versions were Jim Gordon runs a tight ship and weeds out corruption, it’s hard to think of an ordinary police force about to deal with a woman who controls plants or a human crocodile. But despite all of this, Batman is not a great example of vigilantism. He commits the same atrocities that we condemn in society all the time. He routinely tortures criminals, reinforcing the idea that torture is effective and necessary in some instances. Some might say that Batman’s reluctance to kill also makes him ineffective. The argument goes that Gotham City doesn’t seem to have any less crime despite Batman. While I agree that Batman’s methods are ineffective, it really doesn’t have anything to do with his one and only rule. I don’t understand why Batman routinely hands over criminals to normal prisons where they always escape. I understand that it’s a fictional world and the writers have to carry on the story, but give me a break. What if Batman just uses Bruce Wayne’s money and Lucius Fox’s smarts to build a secret, unbreakable prison. And this prison was kept off the books so no one knew where it was. This may seem like a human rights violation and it probably is, but at the point in which you have criminals that are beyond rehabilitation and would be on death row or life in prison anyway, this makes the most sense. This would prevent the rogue’s gallery from ever escaping, without having to resort to killing them or have get free and kill others. But another question I have is why are there so many street criminals in Gotham? Batman is a smart guy. I’m sure he studied some theories of crime in college. It doesn’t take a genius (and apparently Batman is one) to understand some of the basic underlying factors of crime. These factors may not be 100% causal, but there is a strong relationship between them. Bruce Wayne could use his money to address gentrification, offer economic opportunity, influence legislative policy, etc. He may do in some capacity, but so much time is taken being Batman that it may be hard to give these important factors the attention they deserve. So what exactly is good vigilantism? It’s also a tough question. I’m not sure if I have the perfect answer but it makes sense that the best vigilantes offer some type of fairness and effectiveness that a regular, more typical criminal justice would offer in an ideal scenario. That’s why I believe the Flash is a better model for vigilantism than Batman. Both the Barry Allen and Wally West versions of the Flash are great. Unlike Batman, they are more carefree while still doing their duty to protect Central City. The Flash is full of jokes and more relatable to the average citizen even though he has superpowers. It’s the great irony. Batman may be human but he is more detached from people in his own city than a guy who is literally faster than time. The Flash talks to people on the street and the people love him so much that the even built a museum for him. And it seems crime in Central City is far less than Gotham, although I found no statistics to corroborate this claim. 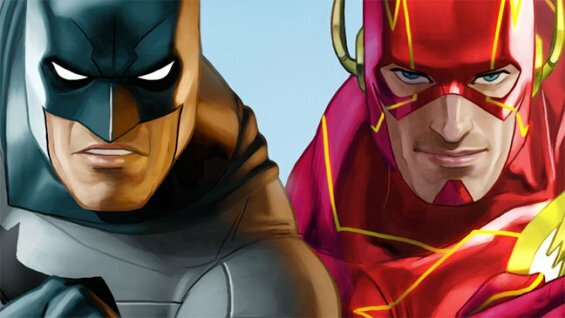 Nevertheless, the Flash’s ultimate advantage over Batman is that he does not have to always fight his enemies to win. Case in point: That moment where the Flash calmly reasoned with the Trickster to turn himself him. This is one of the best scenes in superhero history. It shows that sometimes there is a more nuanced approach to crime fighting than literally beating up those who commit crimes. And apparently the Flash is so important that if he dies, the world ends. The last video is from an alternative timeline and may be a little hyperbole, but it shows how important the Flash is. So why is the Flash a better example of vigilantism than Batman? It basically comes down to the fact that Batman simply uses a failed attempt of violence to solve the problem of…well violence. The Flash, conversely, doesn’t have to beat down criminals to get results. You rarely see the Flash beating his foes to a pulp. Oh and the Flash uses the idea I talked about earlier. In the recent TV series, he literally stores prisoners in a secret prison designed to contain them. Granted there was a prison break, but when you bring the guy from Prison Break, Michael Scofield. Wait…I mean Captain Cold…that’s bound to happen. In you run the tally though, The Flash is much more effective in keeping prisoners locked up than Batman. I mean there are literally entire games and plots focused on people in the Batman universe breaking out of prison (Arkham Asylum, Assault on Arkham, Batman Begins, The Dark Knight Rises, etc.). This phenomena, however, is not much of a recurring theme in Flash’s world. But it’s not just who keeps dangerous criminals from roaming the street. In his spare time, Batman has to play the part of Bruce Wayne and live a lavish lifestyle. Sure he donates to charity, but imagine how much crime he could actually solve if he actually focused on ways to stop it from a non-beat down perspective. The Flash, on the other hand, literally solves crime in his day job as a forensic scientist. Not to mention, Barry Allen has time to have a wife and kids. That’s not to say Batman is any less of a vigilante because he is a bachelor, far from actually. But it means the Flash has people to put things in perspective in way Batman doesn’t. Sure there is Alfred and Nightwing and Robin, but no one really there to actually check Batman. Batman may say he has no times for friends or that friends are just a weakness. In reality, the opposite is true. Friends help put things in perspective and offer a deeper understanding of human nature. For children or people looking up to Flash, they see that you don’t have to sacrifice everything to make a difference. You don’t even have to wear a cap and cowl. You can be part of the criminal justice system or just be a good person. The Flash is kind, considerate, and effective, everything a good vigilante should be. The Batman may have flair and theatrics, but Gotham remains a full of crime and decay. Central City may or may not be a bustling heap of commerce and culture, but it thankfully lacks the perpetual sorrow of Gotham. I used to want to be the Batman, but now I feel like the Flash is my real inspiration. I’m just not fast enough, not yet.